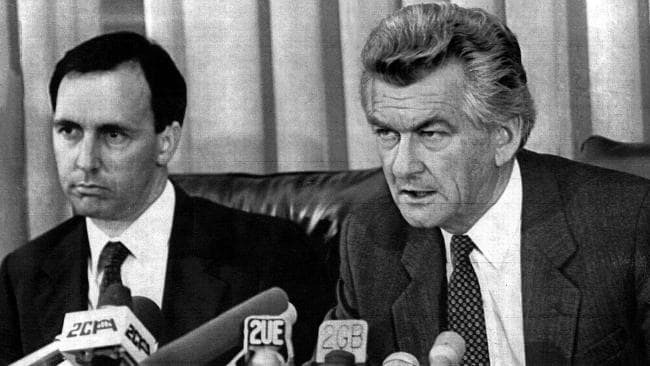 The economic ‘reforms’ of the 1980s are supposed to have set Australia up for an unprecedented run of prosperity: 27 years, and counting, without a recession. The economy’s robustness is supposed to have saved us from the Global Financial Crisis. In fact our economy has been unstable, and its performance has been mediocre verging on anaemic. Any appearance of robust prosperity is due to a huge run-up of debt, some direct intervention, high immigration, overwork, selective blindness and over-active imaginations. This entry was posted in Disgoverning Oz, Economies and economics, Political commentary and tagged Australia, banking, financial crisis, free markets, Keating, Neoliberalism, recession, Whitlam on November 26, 2018 by Geoff. The ABC is pandering more and more flagrantly to the Far Right. Monday 3rd of September was a good night for the Far Right on the ABC. There was a 45-minute exclusive platform for Steve Bannon, alt-Right champion and Trump booster, in an interview on the Four Corners program. Later Q&A, which regularly includes at least one Far Right panel member, had three out of five, including – spare us – radio shock jock Alan Jones, as if he needs another megaphone. This while the ABC is re-running a version of “It’s your ABC” featuring nostalgic clips of the Bananas in Pajamas and the lovely Noni of Playschool. Only it’s not our ABC any more. It has been the Liberal Party’s ABC for some time. This entry was posted in Disgoverning Oz, Society and tagged abc, balance, far Right, media, media balance, Steve Bannon, Zaki Malah on September 15, 2018 by Geoff. It’s not the salespeople, it’s the product. The product does not serve the people and the people know it, so they keep rejecting the salesperson. You might think, after a parade of six short-term Prime Ministers, and counting, that this diagnosis of Australia’s political instability might be more commonly perceived, but much of the attention remains on more superficial factors like personality, technology, social media and so on. Even when the political product is questioned few seem to appreciate the depth of its inadequacy. This entry was posted in Disgoverning Oz and tagged Australia, corruption, democracy, leadership, Neoliberalism, politics on September 10, 2018 by Geoff. With the last of the centenary Anzac commemorations behind us, perhaps we can look more closely at the source of some current attitudes. For nearly two decades government agencies have been quietly filling our kids’ heads with right-wing propaganda. Not only was the Australian nation allegedly forged in the crucible of Gallipoli, but our noble and gallant boys were fighting for democracy and freedom. The ‘Anzac spirit’, also born at Gallipoli, has infused every great thing we have done ever since. The claims are fiction, one long-standing, the others rather newer. This entry was posted in Disgoverning Oz, Society and tagged Andrew Fisher, ANZAC, conscription debates, cultural cringe, John Howard, myth, propaganda on April 30, 2018 by Geoff. Nothing that follows is to dishonour the bravery and sacrifice of the young Australians who suffered and died in World War I. However if we are to avoid repeating such disasters we need a larger and clearer perspective than we have been getting from much of the commentary, official and unofficial, marking the centenary of the war. The Australian nation was not forged at Gallipoli or any other foreign battlefield. There was already a vigorous nation by 1913. This entry was posted in Disgoverning Oz and tagged ANZAC, conscription, Federation, peace, WILPF, wisdom on April 19, 2018 by Geoff. There is widely perceived to be a gap between our stumbling political system and the wishes of the Australian people. However those who look a little deeper into our Australian hearts see not just a gap but a yawning chasm. In a 2016 study by social researcher Richard Eckersley, published in Oxford Development Studies, people were asked which of two possible futures came closer to what they expected, and which of the two they preferred. Scenario one was ‘a fast paced, internationally competitive society, with emphasis on the individual, wealth generation and enjoying the good life’. Three quarters expected a future along these lines. This entry was posted in Disgoverning Oz, Political commentary and tagged clean energy, clean food, community, Fair go, inequality, Neoliberalism on July 20, 2017 by Geoff. The right-wing ideology of the past 40 years has failed. It was always going to fail, because it is based on nonsense ideas, and because it harms people and the natural world. Australian politics has been dragged far to the right since 1980 because both major parties embraced an agenda promoted by right-wing radicals. Now the radical right’s grip on power is finally slipping. We are poised for a major political re-alignment. A BetterNature Short Book (14,500 words). Released 4 May 2017. May the Fourth be with you. See more about my books, existing and forthcoming, here. This entry was posted in Disgoverning Oz, Economies and economics, Political commentary and tagged democracy, free markets, global financial crisis, Greens, Labor, Neoliberalism on May 8, 2017 by Geoff. Australia accomplished an economic miracle in the nineteenth century, rising from subsistence to the richest country in the world. Along with New Zealand, Australia also led the world in political and social innovation, aspiring to provide a fair go for everyone. By 1913 Australia was a distinctive, dynamic and increasingly egalitarian society. Despite some economic, political and psychological setbacks through the twentieth century, Australia by 1980 was a prosperous and open society still generally pursuing the fair go, notwithstanding some notable gaps. Australians also had another great accomplishment to our credit: we had peaceably welcomed a great diversity of immigrants who spiced Oz with many new cultural flavours. We grumbled a bit and might not have openly admitted it, but we were a tolerant, talented, innovative, even interesting lot. Today Australia is a very different place. We are in a lather of fear over moderate challenges that are substantially of our own making. We shrink from big challenges bearing down on us. We are insecure, and increasingly selfish, divided and directionless. We pursue scapegoats, vilifying innocent people and grossly abusing some. We act as though we are incapable, and have to bring in foreigners and their money to run things for us. Yet we can still be generous and tolerant, and we can still sometimes be the fun-loving larrikins we like to think we are. We have abundant resources, talent, skill and energy, and we speak many of the world’s languages. Why do we make such heavy going of it? This entry was posted in Disgoverning Oz, Political commentary, Progressive policies and tagged Australian miracle, clean energy, Fair go, Gallipoli, multiculturalism, Neoliberal failure, oil, terrorism, tolerance on February 12, 2017 by Geoff. Economist Ian McAuley has written a series of articles called Brexit, Trump and the Lucky Countryon John Menadue’s site Pearls and Irritations. The analysis is good as far as it goes, but there are more fundamental factors at work. The neoliberal program never achieved more than mediocrity and overall it has failed even on its own terms. Worse, it has corrupted government, fractured society and visited destruction upon the Earth. This failure flows from two false premises at the heart of neoliberalism: the libertarian claim that people should be rugged individualists, and the neoclassical claim that free markets usually will automatically optimise an economy. Behind the votes for Brexit and Trump lies a simple perception: the system is rigged in favour of the rich. That perception is accurate. People may lash out at scapegoats and follow false prophets, but their disgust and alienation are quite justified. Trump promised to break up the cozy club at the top, and many people said Yes. Two extracts published at Pearls and Irritations, here and here. This entry was posted in Disgoverning Oz, Political commentary and tagged Brexit, debt, inequality, libertarian, Neoclassical economics, Neoliberal failure, rigged, social bonds, Trump on February 3, 2017 by Geoff. Many Americans and Brits are struggling to come to terms with the votes for Trump and Brexit. We haven’t had the same shock in Oz, but we have a creeping version of the same disease. Chip Giller, the founder of Grist magazine, which insists on humour in the face of general insanity, tells how recently he was moved to tears by Harry Potter. Yes, the fictional boy wizard. It’s a powerful story, that’s why it’s so popular. Harry chose to stand for what’s right, against impossible odds. Then a lot of Harry’s friends chose to stand with him, validating the love among them, and perhaps creating a glimmer of hope. Giller was reminded that if enough Americans of good heart and good will stand together they might resist the forces of fear being marshalled by Donald Trump. This entry was posted in Disgoverning Oz, Life & Love and tagged Brexit, fear, Harry Potter, Lord of the Rings, love, Star Wars, Trump on December 20, 2016 by Geoff.